A smoothie (alternatively spelled smoothy) is a blended and sometimes sweetened beverage made from fresh fruit (fruit smoothie) and in special cases can contain chocolate or peanut butter. 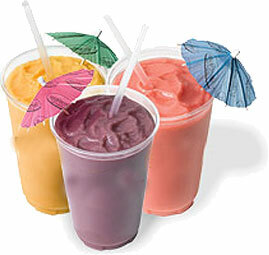 In addition to fruit, many smoothies include crushed ice, frozen fruit, honey or contain syrup and ice ingredients. We can provide you with the equipment & staff to serve this tasty beverage to your guests at your next party or event. Fill out our Request a Quote form for more information.